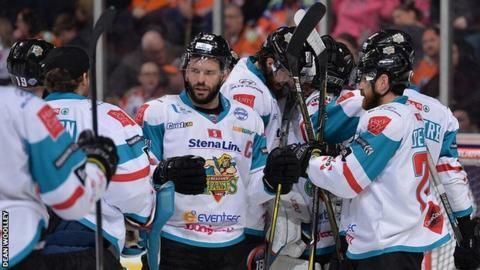 Belfast Giants fought back from 2-0 down to earn a 4-3 away victory over Sheffield Steelers in Sunday's Elite League contest. Goals from Mathieu Roy and John Armstrong appeared to have Sheffield in control at the end of the first period. However, Jonathan Ferland replied before goals early in the final period from Colin Shields and Spiro Goulakos put the visitors ahead. Mark Matheson levelled for Sheffield before Sebastien Sylvestre's winner. The win completed a successful weekend for Adam Keefe's side after Friday's 5-4 home win over Guildford Flames. Belfast remain fourth the table but it edges them closer to the leading trio of Manchester, Sheffield and Nottingham. Dustin Johner, Cole Jarrett, Stephen Murphy, Jim Vandermeer and Kevin Raine were all missing for the Giants because of injury which meant that player-coach Keefe was in the line-up with Jackson Whistle in goals. Belfast will have two more games on the road in Scotland next weekend when they face Braehead on Saturday and Edinburgh on Sunday.